Derry 1-5 Mayo 2-8 (Bellaghy, 5/2/1984). MAYO: S Ward; J Monaghan, P Forde, T Kearney; F Noone, J Maughan, D Flanagan (0-1); TJ Kilgallon, P Brogan (1-1); S Weir (0-3), P Dixon, M Carney; B Kilkelly, G Geraghty (1-0), K McStay (0-3). Sub: J Doherty for Kilkelly. Roscommon 0-10 Mayo 1-6 (Hyde Park, 19/2/1984). MAYO: S Ward; J Monaghan, J Maughan, T Kearney; F Noone,K Earley, D Flanagan; TJ Kilgallon (0-1), P Brogan (0-3); S Weir, G Geraghty, M Carney; P Dixon (0-1), J Burke, K McStay (1-1). Subs: P Duffy for Carney, B Kilkelly for Burke. PROMOTION PLAY-OFF: Mayo 1-7 Roscommon 1-11 (MacHale Park, 26/2/1984). MAYO: S Ward; J Monaghan, K Earley, T Kearney; F Noone, J Maughan, H Gavin; TJ Kilgallon, P Brogan (1-2); S Weir (0-1), G Geraghty (0-1), M Carney (0-1); P Dixon, J Burke (0-1), K McStay (0-1). Subs: J Browne for Maughan, B Kilkelly for Geraghty. FIRST ROUND: Sligo 1-5 Mayo 1-8 (Markievicz Park, 8/4/1984). MAYO: S Ward; J Monaghan, S Durcan, K Earley; F Noone, J Maughan, J Finn; TJ Kilgallon, G Geraghty (0-1); S Weir; P Brogan (0-2), A Finnerty (0-2); P Duffy (1-0, a penalty), WJ Padden, K McStay (0-1). Subs: M Carney (0-2) for Kilgallon, J McGrath for Weir. SECOND ROUND: Mayo 0-6 Monaghan 1-11 (James Stephens Park, Ballina, 29/4/1984). MAYO: S Ward; J Monaghan, S Durkin, M Connolly; F Noone, J Maughan, J Finn; WJ Padden, G Geraghty; A Finnerty, M Carney, TJ Kilgallon; P Duffy (0-6, five frees), J McGrath, K McStay. Subs: M Jordan for McGrath, E Walshe for Carney. SEMI-FINAL: Mayo 3-16 Leitrim 1-8 (MacHale Park, 24/6/1984). MAYO: M Webb; J Monaghan, P Forde, D Flanagan (0-1); M Connelly, J Maughan, F Noone; WJ Padden, S Maher; G Geraghty, H Gavin (0-3), A Finnerty (2-2); T Byrne (1-5), J Burke, K McStay (0-5). Subs: D O’Boyle for Monaghan, M Carney for Burke. FINAL: Galway 2-13 Mayo 2-9 (Pearse Stadium, 9/7/1984). MAYO: M Webb; J Monaghan, P Forde, D Flanagan; M Connelly, J Maughan, F Noone; WJ Padden, S Maher; G Geraghty, H Gavin (0-1), A Finnerty; T Byrne, J Burke (1-0), K McStay (1-7, penalty goal and six frees). Subs: P Brogan for Finnerty, M Carney (0-1) for Burke, J Finn for Connelly. Mayo 1-8 Wexford 2-5 (Crossmolina, 14/10/1984). MAYO: G Irwin; J Monaghan, P Forde, D Flanagan; F Noone, J Byrne, J Finn; S Maher (1-0), P Brogan; TJ Kilgallon, H Gavin (1-3), A Finnerty (0-1); K McStay (0-1), T Byrne (0-2), J Burke. Donegal 1-13 Mayo 1-5 (Ballyshannon, 11/11/1984). MAYO: G Irwin; F Noone, J Maughan, D Flanagan; J Byrne (0-1), E Lavin, J Finn; S Maher, TJ Kilgallon; P Brogan (0-2), H Gavin, A Finnerty; T Byrne (0-1), J Burke, K McStay (1-1). Subs: T Grogan for Maher, M Carney for Burke. Mayo 1-8 Dublin 1-5 (James Stephens Park, Ballina, 18/11/1984). MAYO: M Webb; J Monaghan, P Forde, F Noone (0-1); J Byrne, D Flanagan, J Finn; TJ Kilgallon, WJ Padden; K McStay (0-4), L Niland, M Carney; H Gavin (1-1), T Grogan, E McHale (0-2). Louth 1-8 Mayo 1-7 (Drogheda, 25/11/1984). MAYO: M Webb; J Monaghan, P Forde, F Noone; J Byrne, D Flanagan (0-1), J Finn; TJ Kilgallon, WJ Padden; K McStay (0-2), L Niland, M Carney (0-3); H Gavin (0-1), T Grogan, E McHale (1-0). Subs: K Feeney for Byrne, P Brogan for Padden, J Burke for McHale. Offaly 0-9 Mayo 2-13 (O’Connor Park, Tullamore, 2/12/1984). MAYO: M Webb; J Monaghan, P Forde, M Feeney; F Noone, D Flanagan, J Finn; WJ Padden, TJ Kilgallon (0-1); K McStay (0-5), L Niland (1-1), M Carney (1-1); E McHale (0-1), T Grogan (0-2), T Byrne (0-2). SEMI-FINAL: Mayo 2-8 0-3 Sligo (James Stephens Park, Ballina, 22/4/1984). MAYO: G Irwin; C Dever, J Reidy, E Gibbons (0-1); J McNabb, N Loftus, J Finn; K Reilly (0-2), S Maher; A McGarry, P Brogan (0-1), N Durcan (1-0); B Kilkelly (1-3), T Pidgeon, P Reilly. Subs: P Duffy (0-1) for Brogan, T Morgan for K Reilly, J Gavin for Pidgeon. FINAL: Mayo 2-7 Galway 2-4 (Claremorris, 10/6/1984). MAYO: G Irwin; C Dever, J Gilmore, E Gibbons; A McGarry (0-1), J McNabb, J Finn; K Reilly, S Maher; J Dooley (0-1), P Brogan, N Durcan (1-2); B Kilkelly (0-2), T Morgan (1-0), P Duffy (0-1). Subs: P Reilly for K Reilly, P Corcoran for Durcan. SEMI-FINAL: Mayo 0-9 Dublin 0-7 (Pearse Park, Longford, 5/8/1984). MAYO: G Irwin; C Dever, J Gilmore, E Gibbons; A McGarry, J McNabb (0-1), J Finn; P Brogan (0-4), S Maher; J Dooley (0-2), K Reilly, N Durcan; B Kilkelly (0-1), T Morgan, P Duffy. Sub: L McHale (0-1) for Reilly. FINAL: Cork 0-9 Mayo 0-6 (Cusack Park, Ennis, 26/8/1984). MAYO: G Irwin; C Dever, J Gilmore, E Gibbons; A McGarry, J McNabb, J Finn; P Brogan (0-2), S Maher (0-1); J Dooley, P Duffy, N Durcan (0-1); B Kilkelly (0-2), L McHale, P Reilly. Sub: T Morgan for Reilly. SEMI-FINAL: Mayo 1-16 Leitrim 0-8 (MacHale Park, 24/6/1984). 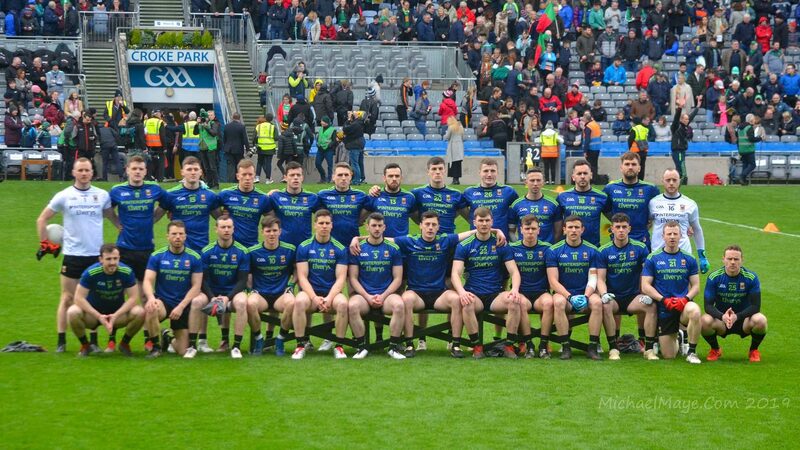 MAYO: M O’Hara; MP Moran, TJ Coleman, E Gilvarry; C Lambert, J Prendergast, M Hunt; P Holmes, J Dolan; K Carey (1-2), M Butler (0-5), L Nyland (0-2); M Fitzmaurice, L McLoughlin (0-2), N McGuinness (0-2). Subs: D Webb (0-1) for Dolan, M Barrett for Hunt (inj. ), P Jordan (0-2) for Nyland (inj.). FINAL: Mayo 2-8 Roscommon 1-11 (Pearse Stadium, 9/7/1984). MAYO: M O’Hara; MP Moran, TJ Coleman, E Gilvarry; C Lambert, M Barrett, M Hunt; P Holmes, D Webb (0-2); M Fitzmaurice, M Butler (0-5), L Nyland (0-1); K Carey (2-0), L McLoughlin, N McGuinness. Subs: J Dolan for Barrett, P Jordan for McGuinness, A Munnelly for McLoughlin. FINAL (REPLAY): Mayo 2-8 Roscommon 3-9 (MacHale Park, 22/7/1984). MAYO: M O’Hara; MP Moran, TJ Coleman, E Gilvarry; C Lambert, J Prendergast, M Hunt; P Holmes, L Nyland; M Fitzmaurice (0-1), M Butler (0-3), A Munnelly (1-0); K Carey, L McLoughlin (1-2), N McGuinness (0-2). Subs: L Gavin for Hunt, J Dolan for Holmes.